British CAPTAIN JAMES COOK, thought to be the first Westerner to set sight on the Hawaiian Islands, spotted the islands of O‘ahu and Kaua‘i on January 18, 1778. Almost a year later, on January 17, 1779, the explorer found his way to Hawai‘i Island. He anchored his ships in KEALAKEKUA BAY, where the annual MAKAHIKI FESTIVAL was in progress. Thinking Cook might be the god Lono, Hawaiians welcomed him with a great feast. On February 4, Cook left the island, only to return about a week later after a severe storm damaged one of his ships. This time, the Hawaiians, who had discovered Cook was not a god, were quite hostile. Cook and four of his sailors died in the battle that ensued. A small BRONZE PLAQUE at the northern end of Kealakekua Bay marks the spot of his death. Near the plaque is a 27-FOOT OBELISK erected by Cook’s countrymen. KAYAKING Kealakekua Bay is a great way to see the monument and explore the surrounding reef. As Kealakekua Bay is a MARINE LIFE CONSERVATION DISTRICT (MLCD), it presents a unique aquatic experience. Landing a kayak is only permissible with a permit, of which there are only 10 available per day. 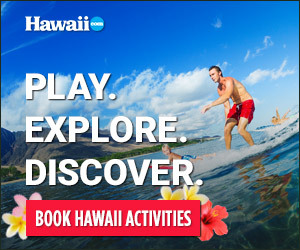 ALOHA KAYAK COMPANY, in addition to renting kayaks and snorkel gear for your trip, makes the link to the landing permit available on its website at www.alohakayak.com.